I wanted to link up with Shell for her Rockin' the Baby party, but I confess I couldn't find any really early baby pics of Pierce. I could scan some but that would take time and I'm really short on time this week. Instead, I snagged a few from old Facebook albums. 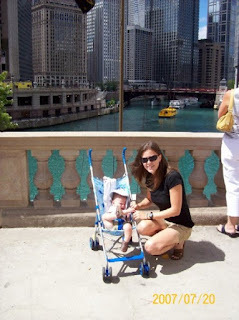 This was in Chicago the summer Pierce was 8 months old. He was having a total meltdown, as you can see. Too much time in the stroller I think, plus a massive case of teething! 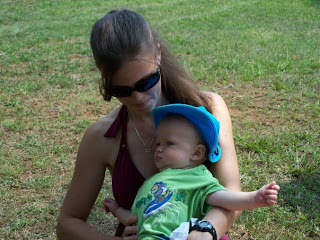 And this is from a summer picnic at the lake. Pierce was also around 8-9 months in this picture. Here are the twins just under four months old. Reid on the left, Cort on the right. And this is hands-down one of my favorite pics of the twins ever! Cort is just having the time of his life and Reid is absolutely miserable and about to lose it. They were just under four months old here too. I guess when I look at all that snow I should be thankful it's 100* outside? This post is linked to Rockin' the Baby. Can anyone ever get enough of baby pictures. Sooo cute! The snow picture is the best - they are adorable!!! Oh, that snow picture makes me just alittle more thankful for today's heat. You are blessed with precious boys, Lisa. That last photo is cute as can be! That last picture is the cutest ever! All of your boys are adorable. Your guys are so cute! 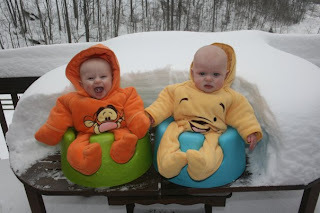 I love the Pooh and Tigger snow suits! Cute cute cute. Loved your blog. You've got a new (Spanish) reader. Oh my gosh, they are adorable - love the picture in the snow! Aw. That last photo is precious. These pictures are adorable and yes, the last one is my favorite!! rofl oh my gosh love the winnie pooh and tigger too!!! Cuteness! Love the picts! I prefer snow over heat any day but I am weird that way,lol! Your boys are so cute Lisa! The picture of the twins in the bumbo seats is so cute!!! Those are just too cute, and that last one is hysterical! I secretly love crabby baby photos. I LOVE the snow pic in their bumbos! I also love seeing you on the pics. 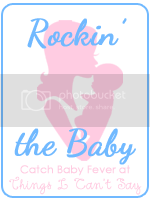 The link up "catch the baby fever" has me hooked. I think I have baby fever! Great pics in the past couple posts. Love yesterdays post too, looks like it was a blast!!! LOVE all the pictures, you look absolutely beautiful! I agree, the pic of the boys in the Bumbo's is pretty stinking adorable! Ohhh, your kiddo's are so stinkin' cute!!! That last picture cracks me up! Hi I just happened upon your blog. I also live in a log home and frequently have bear passing through the yard. So I naturally had to check your blog out. 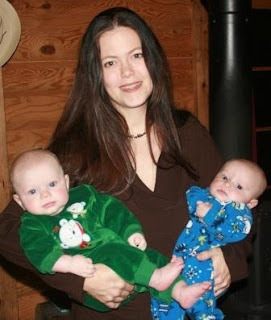 The photo above of you holding your boys is great - you look so beautiful! Just like a Hollywood movie star! I love going down memory lane sometimes and reminisce. It's fun to do now and then. Sweet pictures! I LOVE your twins expressions when they're sitting in the bumbo chairs. You have such cute babies Lisa! And you are beautiful! Great pictures! I love the one of the twins in the snow. I cn't believe how big they are now. Oh my gosh! Your boys are precious! I just love that pic of the twins all bundled up in snowsuits - too cute! Aw, they are so cute! They didn't have those cool bumbo seats when my kids were little, they look like they'd be so great for little ones. Great pics! Gosh I do not miss those kind of meltdowns!!! New to blogging- nice to meet you!! I like the Bumbo seat one! Look at all the snow! They are priceless and how wondeful you have these slices of time saved. Isn't it amazing how soon we see bits of personality. Bumbo seats in the snow? BEST.IDEA.EVER. Love them all, Lisa! So glad you linked up!